BEACH FRONT LUXURY: Imagine... whale watching from almost the entire space of Unit 132 or exploring over 1 mile of private sandy beach. RELAX IN STYLE: Imagine... waking up to a stunning sunrise and the sound of waves crashing ... so close you feel like you can touch them. Situated on a world famous beach at Lands' End, with complete privacy, this is truly a unique property not only in Cabo San Lucas, but in all of Mexico. Order a pitcher of margaritas and famous fajitas from the pool bar… they will even deliver to you as you sunbathe on your private deck. Stroll down the beach and enjoy one of the many pools or restaurants… maybe even book a Fiesta on the beach. Beach-walking-access to adjacent establishments [Playa Grande, Solmar & the spectacular Capella Resort], where U can inquire about paying for services, food, as well as the Terrasol Resorts facilities [including 2 swimming pools with swim up bar and tennis courts], basic gym - you are also within minutes walking distance to Cabo San Lucas and the Marina-Malacon. A truly unique, exceptional Ocean-Front Condo !! I have owned Terrasol Condos since the late 1980's, when it was first built, I am a South-African, Canadian and now Mexican CPA-MBA, and I live and own CASA CONTENTA in Cabo - golf almost daily !! Sunrise-Sunset is the most recently renovated & refurnished unit in Terrasol  ! 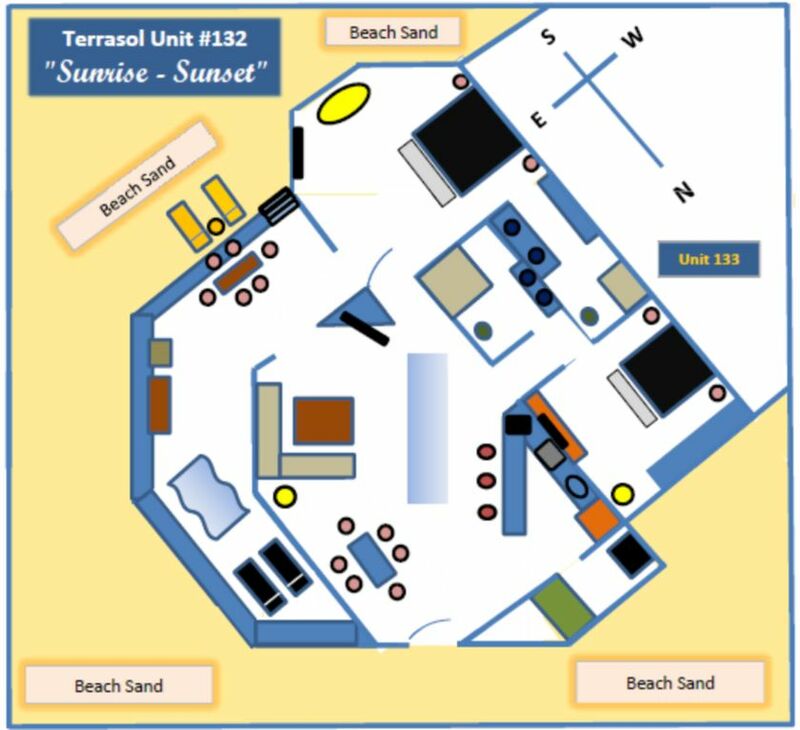 You can walk from Terrasol to downtown Cabo and Marina in "minutes"
Unit 132 "Sunrise-Sunset" - is Built ON the beach !! Ocean-and Beach-View Dining from Living room or decks !! See TRIP ADVISOR - TERRASOL - CABO - to see why "Craig Harrison" is the person to deal with - at Terrasol !! Beautiful 2 bedroom condo on an amazing private beach, master bedroom with a view of the beach and sunrise! Next to the pool, cabana bar, serving delicious food and drink for a great price and friendly staff. Walking distance to the marina for shopping and dining. Love this place! Cabo is a fun place to visit, especially if you choose the right place to stay. Terrasol is right at the end of the marina, spanning all the way to the Pacific Ocean. With three great pools (and a palapa with excellent food and drinks on site), you'll have plenty of ways to relax at Terrasol. The Penthouse is the ultimate in luxury and style in Cabo. You just can't believe the panoramic views from this condo. Everything you need is there, including about 4400 square feet (over 400 square meters) of space. There are three bedrooms, plus a media room that can be used also as a bedroom. Tons of bathrooms, a bar, an open kitchen, and a terrace to live on (with barbecue). The crowning glory of this amazing condo is the master bedroom, which fronts the terrace and the incredible views of the ocean and the resort. Shower for two, huge jacuzzi-style bathtub, tons of space, and perfect for a romantic getaway (even when bringing five or six other family members or friends). Craig is a great host, and all the Terrasol staff were friendly, accommodating, and welcoming. Any little problem gets taken care of immediately. Any arrangements you need, just call 0 to reach the front desk, and it's handled. Of course, you're walking distance from the marina and all its activities and restaurants and nightlife and shopping and ... well, you get the point. While staying there, we also recommend that you check out VacationStoreLosCabos for additional arrangements, and Manta Scuba for diving. For eating, stop at Walmart or Costco on your way from the airport, and pick up some food, because you're going to love to cook in this beautiful kitchen, and then eat on the terrace or dining room, all of which have amazing views. For midday food and drink (I think 9-6), check out the Palapa at the central pool - it features a great dining area, awesome food, and even a swim-up bar. We also used Chef Alex (ask Michelle at VacationStoreLosCabos) to come in and cook a few wonderful dinners for us in our condo (they bring the ingredients, cook, serve, and clean) - great food and so relaxing (and reasonably priced lower than a restaurant!). We've been all over the world, but this was our first time in Cabo San Lucas. If you are thinking about a trip to Cabo, this penthouse is a perfect way to ensure that every second of your vacation is amazing. HIGHLY RECOMMENDED!!! We just returned from a nine night stay at this beautiful penthouse located at Terrosal. This place is amazing and the ocean views are mind blowing. There was four adults with four kids aging from 5 to 10 years of age. Plenty of space for everyone to be comfortable. The outside deck is where we spent all of our time when we weren't at the pool. Yes, the deck is not kid friendly, but we never let our kids on patios by themselves any where. So just use common sense. I can understand why Craig doesn't have any high railings as it would take away from the million dollar view. The kitchen is fully stocked with every type of plate or utensil that you could think of. Overall the house is amazing. Our kids loved the main pool as it wasn't deep, very warm and they could swim up to the bar and order their daily lemonades. The house is walking distance to the marina and a quick cab ride down to Medano beach. Craig was very easy to deal with, always responded right away and gave us great suggestions on where to eat, transportation etc. We would definitely return!! Carlos at the front desk showed us the pictures they took of the hurricane right after it hit Terrosal and all I have to say is WOW, it 's hard to believe all the work that they have done, you would never know that such devastation took place only six months ago. Great job! Fantastic Property with great service and views!! My wife and I celebrated our 15 year anniversary at the Terrasol Penthouse with 4 of our closest friends, we could have not asked for a better location. It was close to the marina, shops and other activities. The house was amazing. The deck provided excellent views of the ocean and was a great place to hang out and socialize. Craig was excellent to work with and was responsive to all our questions. Carlos was amazing, he helped us coordinate transportation and great activities. He even helped get discounted packages to many great sunset cruises and snorkeling activities. You can't go wrong with this property. Can't wait for our next trip to Cabo!! Just went down with 4 couples for a valentines retreat and the penthouse was paradise from the time we arrived. There is no better views in all of Cabo, and the whales were a constant attraction off the amazing deck. There was plenty of space for all of us as we enjoyed relaxing, making meals, and with the Costco close by, you can stock your kitchen with great eats and your favorite liquor/wine's without paying a fortune. The upkeep is amazing and the flowers and landscaping are breathtaking. Plus, the beach is nearly private with being land-locked on each side by mountain cut off's. This probably isn't a place for party animals as many of the owners live there and it's very quiet, however if you want fun, a short walk to town and your in the middle of a party paradise with Cabo Wabo, El Squid Row, etc. We enjoyed incredible dinners by the Marina and down the beach, went fishing one day and caught a Marlin + Maco Shark, played golf, but mostly enjoyed the amazing scenery of this beautiful area. The renter is also amazing providing great feedback and answering questions which made our trip even better. Coudn't ask for a better location! I hesitate to write a glowing review since it might lead more people to discover this hidden gem! We took our three kids - ages 10, 13, and 15 - and this was a perfect spot for our family of 5. The large beds, amazing floor plan and spectacular views were just part of what made it so special to us. We loved having Direct TV - so that we could watch some of our favorite sporting events. The kitchen has all the amenities. And, there are no words for the countless hours spent on the deck reading (and dozing) while watching the sunrise and sunset. We enjoyed walking over to the harbor for meals and sightseeing. The kids got a little too familiar with ordering at the pool, but the prices there are great! We knew that we had found a great place when the kids asked if we really had to leave. Will definately be back many times!